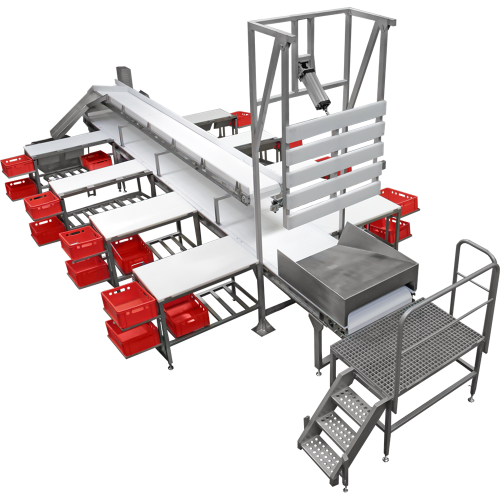 Automated conveyor systems are adapted to your production line and industry branch. Understanding that every business is unique, Nieros will develop your own personalized solution and propose the automated conveyor system that is best fitted to your needs. Together with adapted and fitting warehouse and storage solutions, automated conveyor systems can be fitted to your space and allow for optimum use of resources. In addition, additional functions can be integrated into our products. All of our standard automated conveyor systems are produced using engineering materials and are characterized by compact designs, making them suitable for use in virtually every industrial sector. To ensure optimum performance, each product is extensively tested and has been developed based on years of field experience. We also hold several technical standard certificates. Nieros material handling conveyors and belt conveyor systems help different industry types achieve their highest efficiency. Belt conveyors are continuous conveyors with an endless belt as a supporting and pulling element. They usually consist of a supporting structure of steel construction profiles, rollers and a conveyor belt and some other elements. Especially in processing industries, material handling conveyors are a way of optimizing your resources. Besides belt conveyors we also produce steel belt conveyors, marked by a thin steel strip, if necessary coated with rubber or plastic, and plastic link conveyors, characterized by a band of plastic modules joined into a unit. Belt conveyors, depending on the structural design, can be used for bulk material as well as for general cargo. Nieros flexible conveyor systems are adapted to the modern-day distribution and logistics demands. In every production plant, the challenge lies in the task of transporting certain goods, semi-finished products and components. Nieros provides solutions to the problems where businesses strive for optimized warehousing. The challenges lie in the fact that the space available at the installation site is limited and no delays in deliveries are allowed. It is necessary to aim for the most uniform but flexible transport system possible while keeping the operating costs as low as possible. Over time, various solutions have been developed, while Nieros has achieved the highest level of technical advancement and innovation, balancing the costs. The conveyor belt, transport or assembly line is a classic in the field of infrared logistics, particularly suitable for bulk goods. It is characterized by the fact that it is relatively inexpensive and robust and can transport bulk material without additional containers. It can also display lower selectivity and goods can not be fixed on the belt. The website of the company displays essential information on industrial conveyor systems and other types of logistics solutions. For goods that are too heavy for a conveyor belt, roller conveyors are used. The support rollers are positioned so close together that a belt is no longer required. Even goods that could damage a band can be transported with it. Automatization of work processes and productivity chains ensures more exactness and planning in all phases. Automatic detection and monitoring reduces the risk of human error. By automating the management of critical jobs, you save money, as well as the time that was once used to manually read the parameters. Notification of the deviations and automatic reporting add to time gains. Be sure that we will find the optimal solution and an automated conveyor system for your needs. Do get in touch via email, phone or in person for a personalized offer.